The French Third Republic, a democratic parliamentary regime that lasted from 1870 until 1940, provides a relevant case study with which to examine such issues. During the 1920s and 1930s, an array of violent political groups confronted each other in the streets and meeting halls of France. Extreme right-wing paramilitaries threatened to smash their enemies and bring an end to the hated parliamentary regime. Communists and socialists promised to halt the march of French fascism with the fists of the proletariat. Dozens of people died in political confrontation during the interwar period. 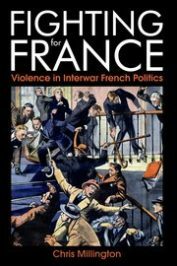 Historians have, however, dismissed French political violence as unserious, confined largely to rhetorical bluster in the press and macho posturing in the street. Consequently, Serge Berstein termed the bitter political conflict of the period a ‘simulated’ confrontation, arguing that French democratic political culture left no room for physical aggression. My research suggests otherwise. Examining violent encounters in a number of settings from the streets to the factory floor, I have investigated the frameworks by which contemporaries understood, justified, and condemned political violence. In the street, armed and uniformed political activists frequently clashed. Many confrontations rested on ideas of territory. For a right-wing militant to enter an area claimed by the left was perceived as a daring display of bravado and heroism and a challenge laid down to the enemy. Such a challenge could not go unanswered and the eviction of the invader was framed a point of honour. 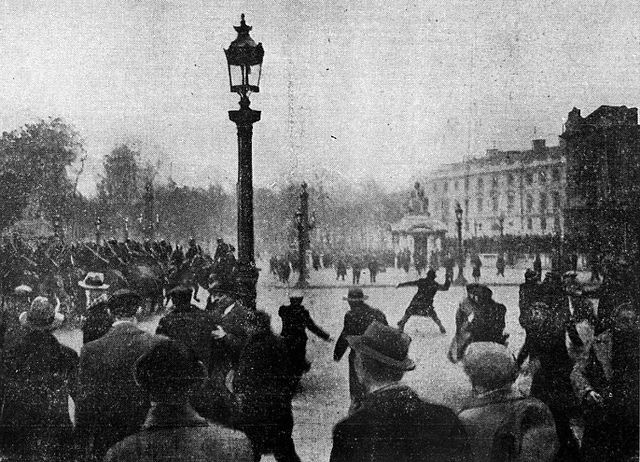 Place de la Concorde 7 février 1934 by unknown. Public domain via Wikimedia Commons. The violent clashes that resulted were interpreted according to shared notions of “manly” behaviour. Much depended on understandings of a fair fight. Opponents were required to face each other in the open, in even number, and engage in hand-to-hand combat alone. To fall short of these standards were considered cowardly. Of course, enemies regularly accused each other of not fighting fairly. The extreme right believed that communists preferred to ambush their adversaries, attacking under the cover of darkness. Antifascists claimed that French fascists regularly fired their revolvers and wore knuckledusters under their leather gloves. All groups considered offensive violence to be undesirable. To attack without provocation revealed a dangerous lack of self-control, an absence of sang-froid and a propensity to fly into a rage; all understood to be “feminine” qualities. Groups on the left and right therefore advised their followers to remain calm under the provocation of their enemies. Violence, however, was legitimate if perpetrated in self-defence. Defensive violence, even when disproportionate to the alleged provocation, was framed as a necessary corrective to the unmanly conduct of the attacker. However, notions of self-defence were ambiguous. Self-defence manuals from the period recommended that, if a citizen felt threatened with attack, pre-emptive violence was the best course of action; it was ‘better to kill the devil than be killed by him’, one guide recommended. Political groups shared this idea and so all violence, including offensive violence, was framed as committed in self-defence. The democratic politics of interwar France certainly offered a means of political competition for a variety of groups. However, this political culture sat alongside a violent subculture based on deeply-held and shared understandings of masculine behaviour. These standards could work to prevent violence yet they also enabled its deployment, too. Notions of fair play were in evidence across society, from conflict in the street, to the sports field, and the courtroom. In fact, trials by jury frequently saw men and women accused of violence acquitted as jurors brought their own idea of popular justice to proceedings. Research into political violence in Germany suggests, too, that activists followed a code of unwritten rules when they engaged in and interpreted violent confrontations. All this suggests that violent subcultures, especially those grounded in gendered ideals, prove remarkably stubborn. Featured image credit: French Election: Celebrations at The Louvre, Paris by Lorie Shaull. CC-BY-SA-2.0 via Flickr. Chris Millington is Associate Professor of History at Swansea University. He is the author of Fighting for France: Violence in Interwar French Politics (Oxford University Press, 2018) and From Victory to Vichy: Veterans in Interwar France (Manchester University Press, 2012).